the amber threads blog: Today's recycled find and the March giveaway! Today's recycled find and the March giveaway! Here's today's recycled / upcycled find on Etsy! Plarn! Plastic Bags recycled into yarn. And this Etsian has converted her's into a market bag. Pretty handy I think. Here's a link to the Etsy listing. And announcing the march giveaway now. To enter leave a meaningful, relevant comment on any blog post of mine, or on my facebook page, or reply to one or more of my tweets or retweet me. Critiquing comments welcome too, please be gentle though! Winner will be picked randomly via random.org on April 2nd 2012. What will you win? Hmm two skeins of multicolored Recycled Sari Silk Yarn from my store! Your recycled sari silk yarn is lovely ... amazing colors. How is it made? spun? Yes it is hand spun by women in India from silk fibres left over after the sari manufacturing process. It is in fact up-cycled rather than recycled. Hmm, I thought I had a post about this. Will post in detail. Thank you. I have seen an influx of plarn projects on Ravelry lately. I admit to never using and am rather intimidated to attempt to spin it but I do find it fastening. Love the fact that the market bag above is made with the plarn - I might have plied it with something vibrant though just because I like colors. I just checked out your etsy shop, and you have some really lovely things! I love your choices of background colors for your photos. Thanks for the comment about my shop. The background colors are from the colored squares on my son's play mat :-). I went and looked at your store, too - some stunning colors! I especially love the purple, fuchsia and gold. Wow. What's the source of the recycled sari silk - is it from the fabric production process, or actually reused from worn out saris? I really must write a post about this. It's from the fibres left over from the sari manufacturing process. It's unused and a more appropriate term would have been up-cycled instead of recycled. The Sari Silk really is lovely yarn, and I'm picturing it knit with silver disks knitted into the hat/scarf as a nod to the Indian Shisha Embroidery. I'm so happy to find your blog ! I've already bought 2 skein of recycled sari on a french yarn fest last year, but I'm not sure how to knit it. I will be please if you show us some example, or some pattern which match with this yarn so particular. Added to my to post list. Thank you. I will create a post about patterns suitable for recycled sari silk yarn. I found your awesome how to make yarn from tshirt post and thought it was the coolest thing then realized that's what my sister made these baskets from http://anarasattic.etsy.com/. Love the yarn and trash into treasure - me please. Oh those baskets are great! Thanks for the link! I have never tried yarn like this. The colors look fantastic as well! I love recycled Sari silk, it is fantastic to work with, I think there is something 'exotic' about it somehow. I would love to 'win' some. I also think plarn is incredibly practical and very strong, I have seen items made with it, but have not worked with it myself yet. You'll be amazed at how soft the feel of the fabric is once knit up. It knits up into a strong fabric, not very stretchy. So it's ideal for bags, scarves, shawls and such. Having said that I can imagine making a vest or cardigan with positive ease as well. wow such beautiful colours! I have never knitted with this recycled sari silk yarn and wonder how it works knitted up. My favourite colour from your etsy store would have to be Pink Magenta Hot Pink its so exotic, I dont normally knit with such vivid colours beautiful. That's one of my favorites too. My current fav though is the green one. I just eyed up that one now, wow it looks amazing! 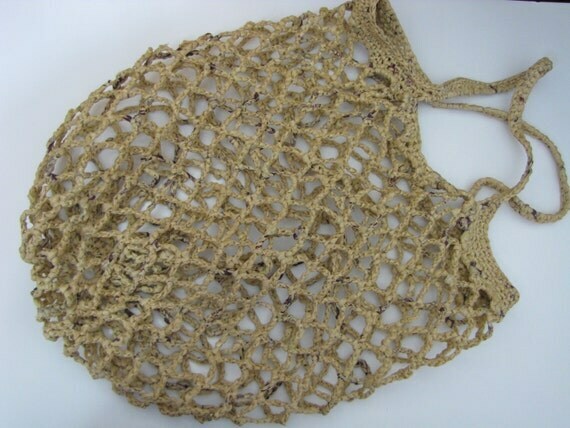 I have a friend that knitted a purse from the banana silk yarn in the yellow gold color. It was beautiful. I like the rainbow silk yarn in worsted weight. Oooh I love the worsted weight silk yarn and the rainbow one is my fav. But I don't know why it's not as popular as I expected it to be among my buyers. I wonder if the pictures aren't good enough! Wow,this is amazing giveaway,colors are amazing.Just visited your etsy shop and I love all the yarn,and stone beads stitch markers.Lovely work. I've always enjoyed meaningful upcycling, and have a few plarn bags laying around my house. You did an amazing job at creating beautiful items from old items. Keep up the great work! Your sari silk yarns are beautiful! I really love how beautiful the yellow is in the banana silk yarn. Knitting a market bag from upcycled plastic bag yarn has a delightful irony to it. The etsy listing linked in this thread does not exist, however. What is the texture of that yarn? Is it feasible to wear? Hmm the Etsy listing for the plarn bag does seem to work. I've never used or touched plarn so I'm not sure what the texture is. Here's the link to the listing if you like http://www.etsy.com/listing/87510045/extra-large-plarn-string-market-bag. Tuesday Find and Recycled t-shirts!